Bexhill is a tiny coastal town people usually skip as they travel to the more exciting and cultural Brighton, or the more iconic and old-timey Eastbourne. Bexhill only really jolts alive when the Summer comes round, the quiet and often deserted beach enticing tourists in. As someone who grew up in the local area, I would often visit seaside town. On Sundays, my sister and I would grab our scooters and have mum drive us out to Bexhill where we would take full advantage of its steep slopes, nearly always coming home with grazes on our knees and a guaranteed rush of wild adrenaline. When I was younger, I always thought Bexhill was a strange place stuck in a time period in the past. Upon growing up from my pigtail days and returning to this familiar spot, I could finally see the art life seeping in where my child brain and wonky eyes had neglected to look. My first stop upon entering Bexhill was the De La Warr Pavilion. This hulking building reeked of art, with its sweeping curves and giant spiral staircase. Walking through the airy space filled with grannies and screaming children, I found it hard to believe this was the spot for Bob Marley’s first ever UK gig. But it is true – the De La Warr has it all. In keeping with its artistic exterior, there is an exhibition hall within it that changes every month or so. I have seen Andy Warhol’s work plastered across those white walls, but this time I walked around on creaking floorboards, staring closely at the print work of graphic designer Willem Sandberg. The gallery always smells of vinegar and old – a scent hard comprehend unless you have been there yourself. Upstairs in the Pavilion, there was an exhibition called ‘The People’s Pavilion’, which pretty much is exactly what it says on the Campbell’s soup can. The walls were decorated with a timeline, pointing out important events throughout history. On one wall, people were encouraged to write on a piece of paper an event they have been a part of at the Pavilion. I was interested in someone’s account of seeing Spike Milligan as he was stationed there during the war, and in that moment I wished I could have travelled back to be in his presence myself. 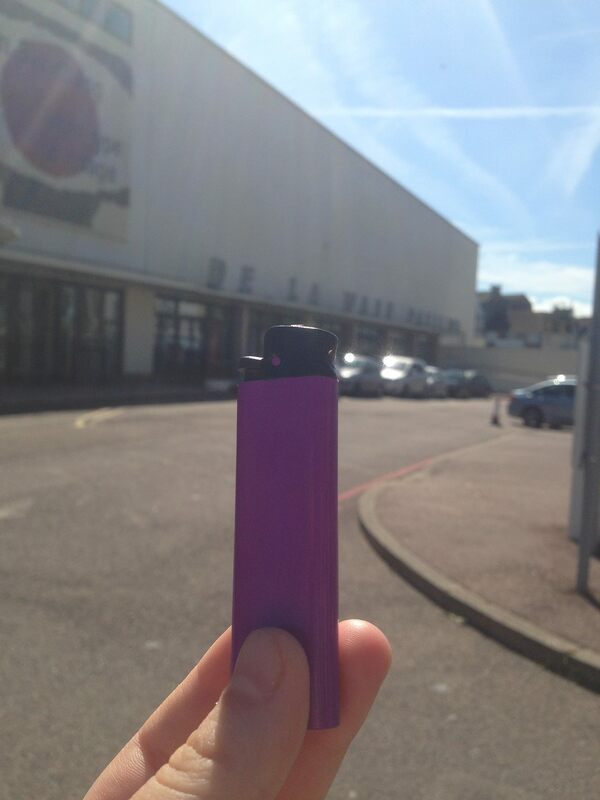 I bought my lighter at a nearby tourist shop. The colour purple has always seemed like an arty colour to me – do not ask me why. It reminded me of Bexhill and the subtle art life moving under the wrinkled skin of the locals. After exploring the Pavilion, I finally visited the beach. It seemed practically empty, but then I noticed most people had gravitated towards the café to watch a few men perform some generic rock tunes. I walked along the seafront, where the walkway had recently been remodelled. All along the stretch of pavement from Bexhill A to Bexhill B there are sculptures children can play on. I was tempted by the wobbly wooden bench myself, but remembered I like to maintain some semblance of dignity. I stopped at the Sovereign Light Café, a tiny wooden shack that would not mean much to the average person walking by on their way to somewhere, but as someone who is aware of its music culture significance, I had to stop and snap a picture. The band members of Keane grew up in the surrounding area, so they used to visit this café a lot. In 2012 they released a song called ‘Sovereign Light Café’, with lyrics mentioning many places in the local area that I recognised. Some of my friends were even in the music video as part of the Heathfield Silver Band. It is not just Keane who grew up close to Bexhill. The famous comedian Eddie Izzard had Bexhill as his stomping ground, and he even used to work in the De La Warr café. Eddie often comes back to perform his arena tour material on the tiny wooden stage in the Pavilion, and I have sat in the front row at one of his shows dedicated to raising money for the crumbling old venue. I have also been to see Duane Eddy here, who did not come from the local area but is still a world-famous musician who has influenced many of my favourite artists. And so I say this, do not miss out Bexhill on your coastal tour of the UK. There is too much history there to ignore. Wonderful account and well written.